Joyce Litzky Kurnow was born on June 12, 1916 in the Bronx, New York to an Eastern-European, Jewish, immigrant family. Her father was a cutter in the garment industry, a skilled, well-paying position, but he yearned to have his own business. When these attempts failed, Joyce’s mother, Anna, went to work in the garment district’s sweat shops from time to time. Anna loved music and saved enough to buy her daughter an upright piano and provide her with lessons from the time Joyce was eight years old. Joyce grew to love the piano, which provided respite from her two noisy brothers and a fairly difficult home life. She was fortunate to have an excellent teacher and was giving concerts at Carnegie Hall and had her own radio program while she was still in her teens. Despite her exceptional ability, she was unsuccessful in gaining admission to Juilliard. Joyce continued to take lessons and perform, and in her early twenties she started to take on her own students. In her mid-twenties, she married and put aside her dreams of a career in music. She taught piano lessons until 1942 when her first child was born. The rest of her life, she played nearly every day, bringing joy to her children and grandchildren. She also acted as the rehearsal pianist for her synagogue’s choirs, a chamber group, and a suburban symphony orchestra. She enjoyed helping other musicians perfect and enjoy their music. Her talent escaped her hree daughters, but her grandson, Aaron Weistrop, is a graduate of the Oberlin Conservatory of Music and a professional musician in Chicago. Joyce died at the age of 89, having spent the final eight years of her life in the downward spiral of Alzheimer’s disease. Until her last days, she would sit at the table in her wheelchair, moving her fingers across the table as if it were a keyboard. She would be very proud to know that she is still helping others to experience the joy of creating music. 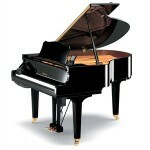 We appreciate this generous gift to help provide pianists for SAW!